International trade makes up a big part of the US economy, and of the 50 state economies that together make up that whole. Using Census Bureau data, Business Insider found the biggest imported good in every state and DC, based on total dollar value in 2016. The US Census Bureau regularly publishes data on international trade for each of the 50 US states and WashingtonDC, including the biggest imported goods in each state based on total dollar value. For many states, raw materials like crude oil and natural gas had the highest import volume as measured in 2016 dollars. 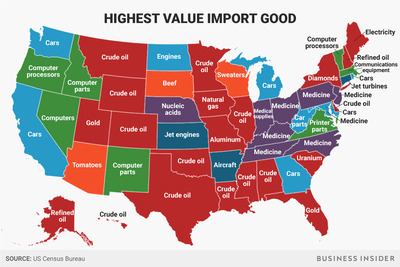 Electronics and medical supplies also ranked as the biggest import for several states. It’s worth noting that the data provided by the Census Bureau only covers trade in material goods, and doesn’t include international trade in services – for example, a Dallas-based construction company hiring an accounting firm in London.